From as far back as I can remember, I've always loved chocolates and colors – M&M's and Smarties were definitely my favorites. I think it ran in the family, because today, all of my siblings love chocolates. Of course my palette for chocolate developed as I grew older. Color however, still strikes me the same as it did as a child. I'm still wowed by the appearance of colors, most especially the bright, vibrant ones. Now that Valentine's Day is upon us, you can imagine how my mind must be working with all the chocolates and bright color displays set up all around town. It seems everywhere you look, it's all about chocolates, color and love. A few days ago I was surprised with a box of Villa del Conte chocolates. I was immediately captured by the red box, with gold heart that says amore. I opened it up and found myself in love. All these beautifully colored, wrapped chocolates in various sizes were more than just a delight to my eyes. I didn't know where to start. Being the OC type of person I am, I separated each by color and size, and thought this is something I cannot do alone. Luckily the chocolates came with a catalog, and I was able to narrow the chocolates down to the flavor of the Praline Balls and Praline Sticks I was given. Now onto the chocolates, or shall I say cioccolato. As always in an assortment of chocolates, there are a few that may not be the most pleasing. Let's face it we've all had a box of chocolate where we've taken a bite and in our dislike either threw it out, put it back on the box for someone else to try. With Villa del Conte, there was no such thing. Coming from a family of chocolate lovers, I would know. It certainly was not hard to entice my family to help me enjoy the chocolates. It also helped to have my family from the U.S. visiting. We sat around my dining table, like scientists in a lab station… minus the lab coats of course. A mix of male and female with ages in the twenties, thirties and sixties; we were ready to dig in. And did we ever. Unwrap. Touch. Smell. Taste. Repeat. In the end, the contents of the box all became favorites. And let me tell you about these favorites. The praline balls were the true champion! They had the right texture, sweetness and whether milk or dark, the cocoa taste was just PERFECT. The combination of caramel, coffee and hazelnut creams each coupled well with the praline ball mirroring a perfect marriage of consistency and quality. But it was the crunch of the cereal that sealed the deal. It added a certain je ne sais quoi that our group agreed on wholeheartedly. It's almost as if the smoothness of the chocolate was complimented more by the crisp cereal giving it that extra AMORE. This does not, however, mean that the ones without cereal were not equally as good, in fact it was a hard decision to come up with any favorite. Hence, why they all became favorites. In addition, there is uniqueness in the fruit-flavored praline chocolates that make each stick a standout in the box of colorfully wrapped treats. Each one contained a different fruit which included strawberry, banana, watermelon and orange. Each fruit elevated the sensation of the chocolate by adding a refreshing element to each bite. It's like that first kiss on an awesome date. More than satisfied, but wouldn't mind having more kind-of-feeling. And since it's fruit, it definitely has a healthier ring to it. Villa del Conte captures my love for both chocolate and color. Heightening each sense from sight, scent, touch and taste; this chocolate proves to be the perfect diamond in a world full of rhinestones. A perfect gift for any occasion with unique packaging all on its own, these chocolates certainly air a feeling of love. One can truly taste the love in every bite. 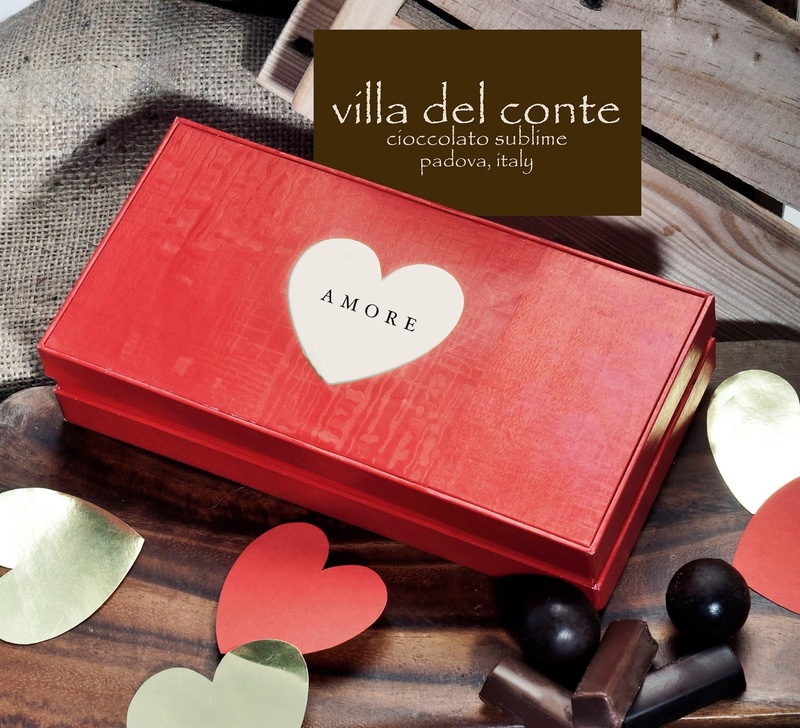 Since it's that time of the year, there is no better time than now to grab a box of Villa del Conte and fall in love even without getting it from Padova, Italy where it all began. Visit Villa del Conte stores at Greenbelt 5, Shangri-la Mall, Resorts World, Alabang Town Center, and Robinsons Magnolia. For bulk orders of Villa del Conte chocolates, please contact 893-2575 or 621-6101.